Elizabeth Atwood is a student at the University of Denver and is an ISA Featured Blogger. She is studying abroad with ISA in Cape Town, South Africa. Food is important. And as a vegan, I wanted to be sure that the location I picked for study abroad would have enough convenient and delicious options. Luckily, Cape Town did not disappoint. This blog highlights some of my favorite food that I’ve encountered here in South Africa. Cape Town is a great city for vegans and for the most part, I am always able to find something suitable on the menu. At the University of Cape Town (UCT), vegan food is affordable and easy to find. There is a food court with 5-6 food counters, and food trucks/tents outside of the food court. At “SuperSandwich”, for R40 (roughly 3USD), you can buy a hummus and tomato sub. At the falafel food truck, you can buy a falafel for 2USD. There is amazing Indian food, vegan rotis, vegan chocolate cake, and jumbo vegan muffins. Most of the coffee shops at UCT have soy and almond milk. Outside of UCT, downtown Cape Town has an enormous amount of vegan restaurants to choose from. 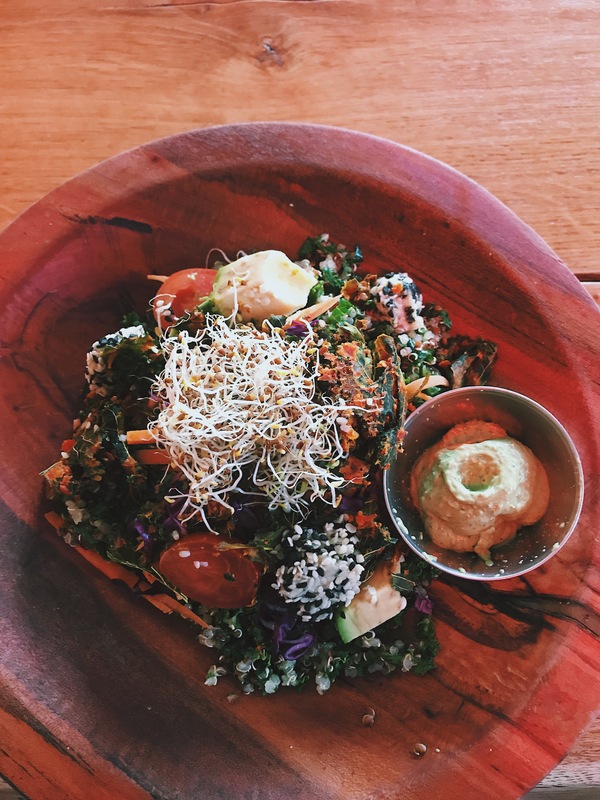 This salad is from “Scheckter’s RAW Gourmet” and is full of quinoa, kale, and tofu. Definitely the best salad I’ve had here. This meal was from “Timbuktu”, a local Ethiopian restaurant. 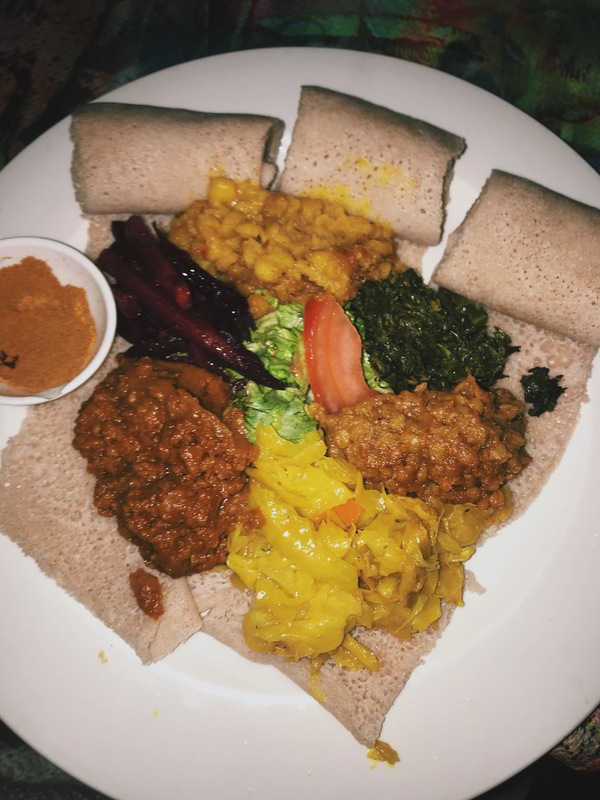 For less than 8USD, you can get a large platter full of spongy injera bread, lentils, spinach, banana peppers, and beets. 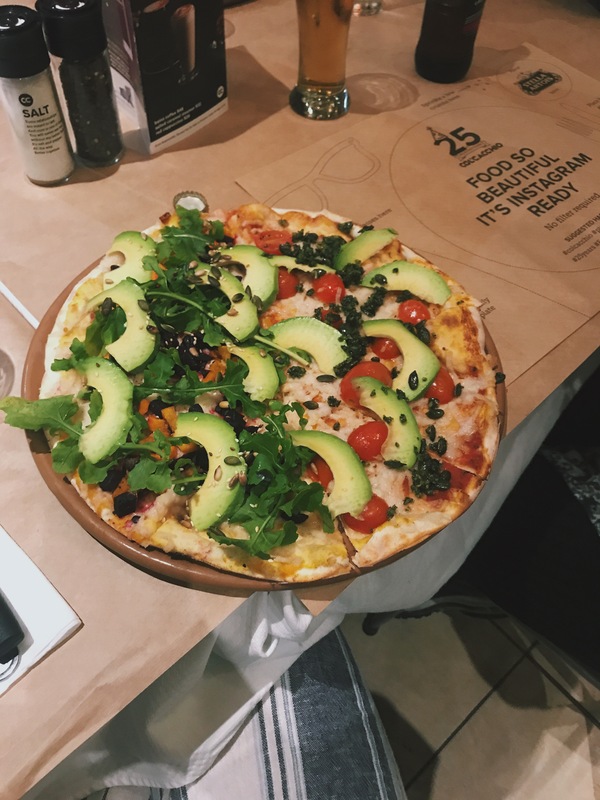 This pizza is from a cute restaurant in a nearby beach town (Camps Bay) called “Col’Cacchio”. My friend and I tried two different types—one with sweet potatoes and arugula, and one with basil and tomato. Unfortunately, I have an extreme sweet tooth. 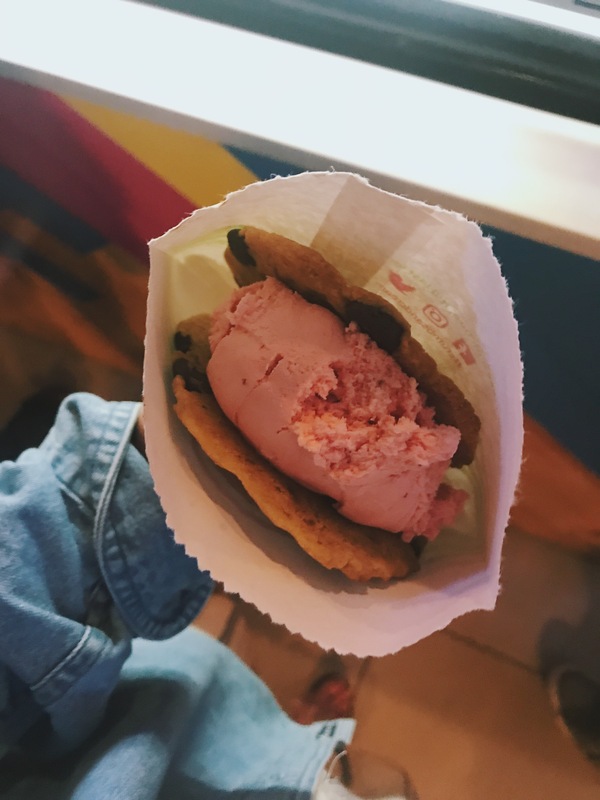 But this vegan ice cream sandwich (chocolate chip cookies and strawberry ice cream) from “Crumbs & Cream” does the trick. If you’re an acai bowl fan, “Nourished” is the place for you. There are not only beautiful acai bowls as pictured here, but smoothies, salads, and traditional breakfast courses are also available. On Saturday mornings, my favorite place to go is the “Old Biscuit Mill”, where local restaurants and home cooks set up stands to sell fresh food. Every type of food you could ever imagine can probably be found here. 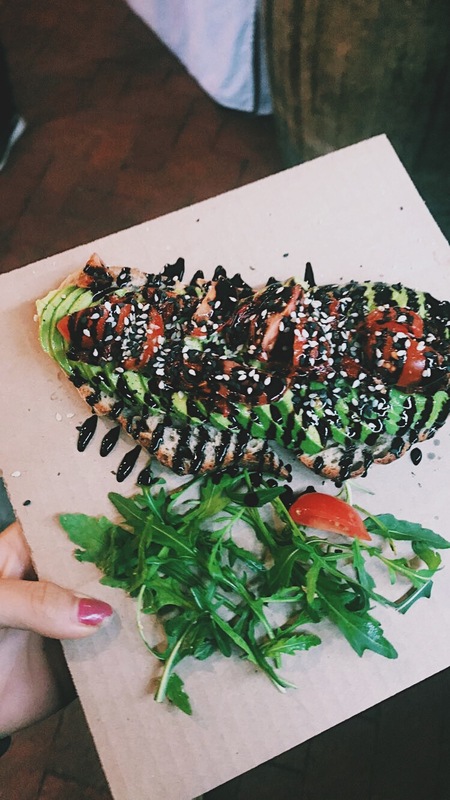 I have included some of my favorite meals from “Old Biscuit Mill”, including avocado toast with sun-dried tomatoes, hummus and falafel balls, and vegan cake. Clearly, being vegan in Cape Town (and enjoying the food) is no hard task. I have only described a small portion of the incredible and affordable vegan food I have stumbled upon. 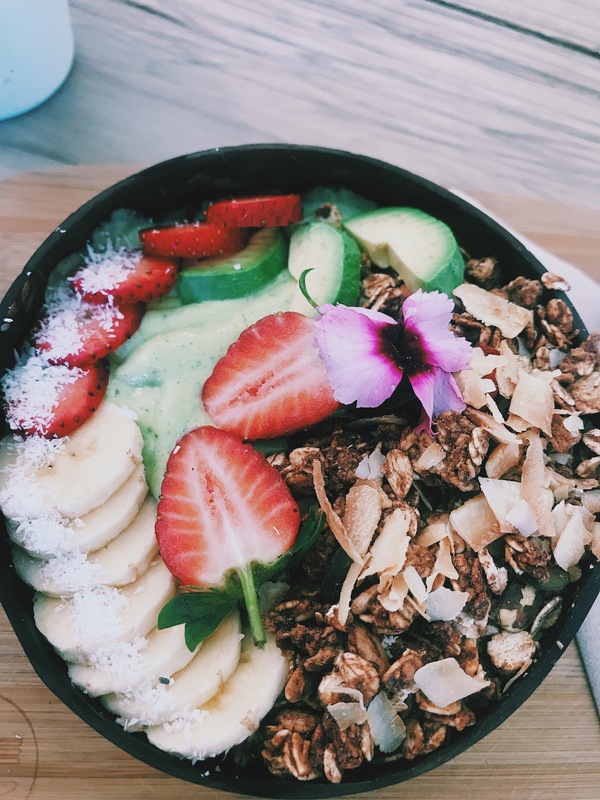 There are numerous other vegan restaurants close to the University of Cape Town, downtown Cape Town, and surrounding areas such as Sea Point and Camps Bay. If you are vegan and am considering studying abroad in Cape Town, you can be sure that the food will be more than sufficient.